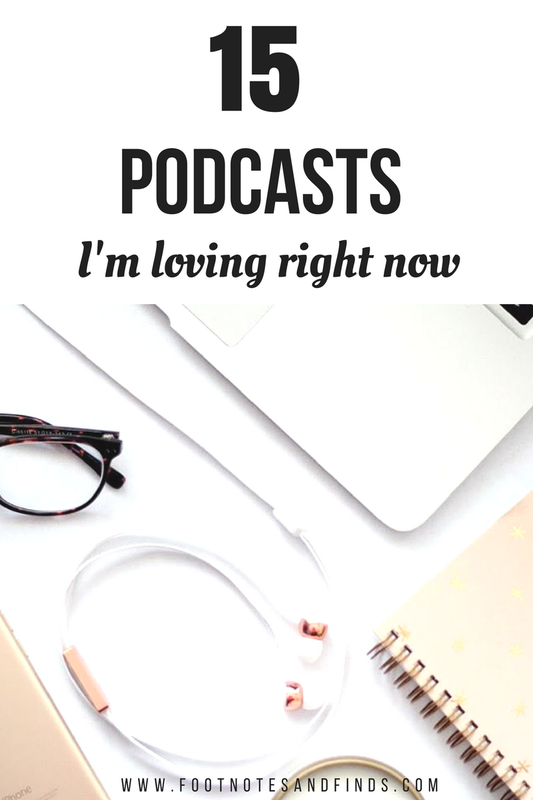 My love for podcasts might have come later than most's. A couple of years ago I saw the podcast Serial pop up everywhere. I decided to give it a try and I was hooked! Since then podcasts have filled many different voids for me. The craving for beautiful stories and story telling, the crave for knowledge and learning I have been missing since finishing my Master's couple of years ago, to my interest of international current events and politics, social sciences etc. Podcasts accompany me on walks and make me look forward the walks, sometimes adding another block or two of walking to my walking because the podcast is so good. They accompany me when I'm cleaning, or cooking or waiting for public transportation. Through these podcasts I meet so many people and their stories, I hear so many viewpoints and I'm transported to different places, times and minds. I hear voices and issues that are very personal to me as a second generation Canadian, a person of colour, being a women in podcasts such as "pushing hoops with sticks" and colour code. I hear beautiful stories of "love, redemption and loss" via "modern love" - stories pertaining to my generation. I have gained so much more knowledge about indigenous women and people of Canada via podcasts such as "missing and murdered". "Sparked by a chilling tip, Missing & Murdered: Who Killed Alberta Williams? is an eight-part podcast investigation that unearths new information and potential suspects in the cold case of a young Indigenous woman murdered in British Columbia in 1989." "In 1972, five-year-old Adrien McNaughton vanished while on a family fishing trip in Eastern Ontario. Despite an intensive search and investigation, no sign of Adrien was found, no clue as to where he might be. The case has hung over the area like a dark mass ever since, especially in the small town of Arnprior, where the McNaughton family lived. In season one of the podcast Someone Knows Something, host David Ridgen, who grew up in Arnprior, goes back to investigate. Ridgen, a independent filmmaker with a proven record of solving cold cases, asks the questions that have been waiting for answers for over 40 years. He speaks to family, friends and other members of the community, discovering new leads and evidence, trying to put the ghosts of the past to rest. " "On December 31, 1997, at a New Year's Eve party broadcast on live TV, Sheryl Sheppard accepted a marriage proposal from her boyfriend, Michael Lavoie. Two days later, she disappeared. In Season 2 of SKS, documentarian David Ridgen joins Sheppard's mother Odette on her search for answers." " If there’s one thing Canadians avoid, it’s talking about race. This podcast is here to change that. Join hosts Denise Balkissoon and Hannah Sung for a new conversation on race in Canada. We won’t have all the answers but we do ask bold questions." cbc ideas"The show describes itself as a radio program on contemporary thought. The subject matter of the shows varies, but music, philosophy, science, religion, and especially history are common topics. The show has won many plaudits for its quality and depth"
"Get ready to meet the artists you're talking about, and the ones you'll soon love. Whatever you're into -- be it music, TV, film, visual art, theatre, or comedy -- q is there. Expect deep insight, and big surprises. Because on q, arts and entertainment get personal." Freakonomics Radio is an award-winning weekly podcast. Host Stephen Dubner has surprising conversations that explore the riddles of everyday life and the weird wrinkles of human nature—from cheating and crime to parenting and sports. Dubner talks with Nobel laureates and provocateurs, social scientists and entrepreneurs — and his Freakonomics co-author Steve Levitt. Most weeks This American Life is the most popular podcast in the country, with around 2.5 million people downloading each episode. One of our problems from the start has been that when we try to describe This American Life in a sentence or two, it just sounds awful. For instance: each week we choose a theme and put together different kinds of stories on that theme. That doesn't sound like something we'd want to listen to on the radio, and it's our show. pushing hoops with sticksA podcast about pop culture and America with the artists and icons that both produce and consume the values broadly categorized as "American". What are the stories this country chooses to tell about itself, through whom, and why? "Science Vs takes on fads, trends, and the opinionated mob to find out what’s fact, what’s not, and what’s somewhere in between. This season, we tackle organic food, attachment parenting, gun control, fracking, and more. Hosted by Wendy Zukerman." "This is Hell is a weekly longform political interview program broadcast across Chicago on WNUR since 1996. Every Saturday morning, Chuck Mertz works off his news hangover by talking to the journalists, authors and activists working to make this world a slightly less hellish place. Expect in-depth conversations about the forces that drive politics, and gallows humor about a world with more questions than answers." "Ted Talks especially formatted for audio. TED is a nonprofit devoted to Ideas Worth Spreading. On this feed, you'll find TEDTalks video to inspire, intrigue and stir the imagination from some of the world's leading thinkers and doers, speaking from the stage at TED conferences, TEDx events and partner events around the world. This podcast is also available in high-def video and audio-only formats." "Based on Talks given by riveting speakers on the world-renowned TED stage, each show is centered on a common theme – such as the source of happiness, crowd-sourcing innovation, power shifts, or inexplicable connections – and injects soundscapes and conversations that bring these ideas to life." "The Hidden Brain helps curious people understand the world – and themselves. Using science and storytelling, Hidden Brain's host Shankar Vedantam reveals the unconscious patterns that drive human behavior, the biases that shape our choices, and the triggers that direct the course of our relationships." "Stories of love, loss and redemption. The Podcast features the popular New York Times column, with readings by notable personalities and updates from the essayists themselves. " We would love to hear what podcasts you love listening to, let us know in the comments. Thanks for these podcasts suggestions. I definitely need something to help me procrastinate, I mean enhance my understanding of the world as I'm trying to get through grad school. Colour Code sounds interesting and I'm glad that it's starting a very important dialogue. You should listen to 'My Favorite Murder' if you like 'Someone Knows Something' and 'Missing and Murdered'. It's amazing! I love all of those! Cool! will try them out! Hey, guys! These podcasts looks really cool. Thanks for taking the time out and sharing with us this great information. Please keep it good posting. Do not hesitate to use http://custom-paper-writing.org help as the best solution for all paper troubles that may occur 24/7! It's good to know I'm not the only one who became addicted to podcasts from Serial! I've actually been looking for a few podcasts to fill the void since. Thank you for giving me a few to check out.